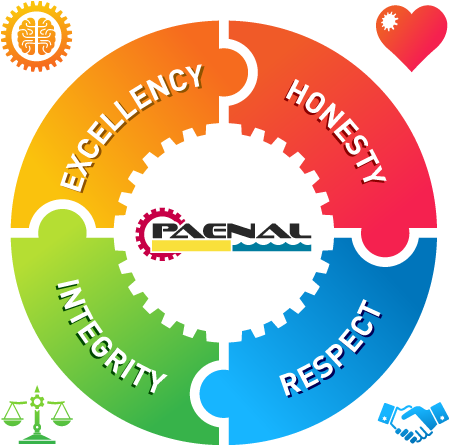 In Paenal we are building a culture of respect, excellence, integrity and honesty. Integrity is a personal choice, a commitment to moral values, honor and ethical principles. We apply our values in our work, no matter how hard it could be. In Paenal, it’s our duty to reward good performance, train those who have difficulties in reaching their goals, honor all around us regardless of race, ethnicity, origin, beliefs or gender. The meaning of honesty is fairness and straightforwardness of conduct. Honesty is related to the moral nature, connoted with integrity, included in individual conduct, together with the absence of lies, deception, theft, dishonesty, etc.Honesty means being trustworthy, loyal, fair and sincere.